Avoid the cutting edges of your tools at all times. By that I mean never have your hand or arm or body in the direction of the tool's travel. Don't let anyone stand directly in front of you when you are carving because sometimes the tool slips out of your hand and if, by chance, you are driving the tool, it can go across the shop in a hurry, cutting as it goes. Never use a carving tool to whittle with. Use a sharp jackknife. Never use a dull tool. More accidents are caused by dull tools than sharp ones. Take care when you use these lethal weapons. They don't care what they cut, but you do-presumably. A short jack plane, i.e., an 8-inch plane. A jointing plane, i.e., an 18-inch plane. A "turning saw," usually called a scroll saw. This is a hard tool to manipulate, but you can use it to advantage, although it will take a lot of practice. A hand drillthe eggbeater type. A set of fractional drills, running from 1/16 to ¼ inch in 1/64 inch sizes, high speed steel. A couple of good hand screw drivers. A set of nail sets. The best claw hammer you can buy. off. If you are going to use plugs and screws for jointed parts, buy, as extras, one ¼ inch bit, one ? inch bit. File off the sides of the wormthat is, the threaded portionon each side so it won't travel into the stock and file down the edges, or the "lips" as they are called; thus, a hole counterbored with the tool will be a press fit for the same-sized plug. (See Figure 3-3.) Two plug cutters, one 1/4 inch and one ? inch, can be bought and used in the bit brace for your own use. 1. File off threads on spur on two sides. This prevents threads from dragging tool into wood. 2. File down outside of lips a little at a time so that the hole developed in the wood is a press fit for the plug. 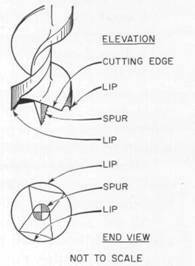 Note: If the tool is to be used in drill press, saw off taper on end of shank; if in bit brace, retain this taper end. Take care of the plug cutters because if you have to sharpen them you have to file down the lips of the bit to fit the reduced size. A good backsaw, sometimes called a "tenoning saw." A good 10-point cross-cut hand saw, commonly called a "panel saw." A pair of carpenter's dividers and a carpenter's scribe (pencil compass). An accurate try square or combination square is a "must." If you are not skilled in the use and application of any of these tools, learn how they are used and why. Handbooks on their use are available. Keep the edged tools sharp and clean from gums and rust. A set of rifflersspecially cut and shaped filesis a necessary part of your carving tool collection. A wood rasp. I find a 10-inch, half round rasp is best. There are two more tools you can use to advantage, a spoke shave and a draw shave. Another point I want to make. Have a place in your shop for everything and keep everything in its place (Image 16) . I'll bet a dollar (Confederate money) you've spent many an hour hunting for a tool you put down somewhere. I know I did before I learned to hang up as many of the carpenter's hand tools on the wall as I could get up. 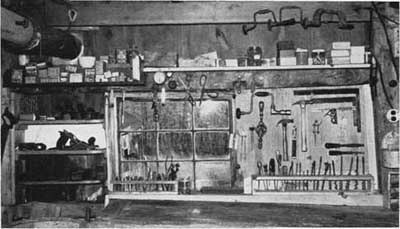 All these tools can be bought at any good hardware shop or from the "catalogue"excepting the rifflers which can be bought, usually, from the carving tool dealer. All the tools I have mentioned have their place in a wood carver's scheme of things, as will be shown. All of them require skill in their proper use, and they can be abused, too. Sharpen edged tools in the list given above in the same manner as is described for carver's tools. Keep in mind the fact that a lot of strength need not be put forth in using tools of any sort. Let the tool edge do the work; your primary function is to guide the tool in the direction you want it to go and in the manner you want it to cut. It is more advantageous to make a lot of light cuts than a couple of heavy ones. The final results are better, and less effort is required. Also, the tools can be guided better. Machine tools are timesavers only. They cost money. They will cut anything in front of the blade; fingers (as I know to my sorrow); clothes, if you wear loose, floppy things; wood, metal, and anything else. "A place for everything and everything in its place." Part of the wall space taken up with the most generally used carpenter's and casemaker's tools in my shop.